Accommodation Originally a Crofters Cottage built circa 1898, Strathview Cottage has been refurbished to offer quality holiday accommodation near the famous Gleneagles Hotel and Golf Resort in Perthshire, Scotland. This Cottage is the perfect getaway. The cottage comprises of a bright lounge with a large, leather sofa & chair, writing desk & chair, large flat screen TV with Freeview and a wonderful, wood burning stove leading out through large patio doors to the beautifully landscaped garden and views towards the hills. Accessed from the front or rear halls, the fully equipped kitchen has a dishwasher, fridge & freezer box, oven & hob, microwave and cooking utensils, with the boiler cupboard housing the washing machine and central heating system. The king size* bedroom can be accessed from the front hall or from the bathroom with traditional roll top bath and shower. Good quality bedding, fluffy towels and dressing gowns are provided for the comfort of guests during their stay. Private parking is provided to the side of the property. To the rear of the property is the stunning garden space. The owner, a professional landscape gardener, has taken time to create a unique space with plenty of hidden seated nooks and an abundance of colour from the magnificent foliage. The charming, hand built, summer house provides a spot to sit and admire the views of the hills beyond. Accessed from the rear garden is a storage room which houses the tumble dryer. This would be the perfect place in which to store sporting equipment such as bikes, fishing rods or golf clubs, as well as wet gear & muddy boots for those seeking an activity holiday! Area There are shops, cafes, restaurants and bars in the local town of Auchterarder (a short walk from the cottage), or both Perth and Stirling are just 15 - 20 minutes drive away. The nearby Gleneagles Golf Resort offers three full courses, including the Centenary Course created by Jack Nicklaus which hosted the 2014 Ryder Cup. There is also the 9-hole PGA Academy Course where families can learn to play together and a pitch and putt course for a little extra practice. The resort also provides traditional sports; shooting, falconry & fishing alongside Segway tours and pony trekking. If you're looking for something a little more relaxing, you'll be spoilt for choice with signature treatments in the Spa or just relax in one of the cafes or restaurants nearby. Strathview is an ideal base from which to explore Scotland with Edinburgh, Glasgow, Stirling and Perth easily accessible by car or train. Alternatively, travel north for the splendour of the Scottish Highlands. 25% deposit is required to secure the dates with the balance due 8 weeks prior to arrival. Where a booking is made within 8 weeks of arrival then full payment will be required at the time of booking. We accept most forms of payment including bank transfer; all major credit cards and UK issued debit cards. Credit card payments incur a 3% surcharge - debit cards are processed free of charge. Rental is inclusive of linen and towels, as well as utilities (gas and electricity). Fair usage policy applies. All breakages are chargeable. Click Book Stay has the right to charge a fully refundable security deposit. Once a booking deposit has been paid and the booking confirmed in writing, the Tenant is liable for the whole amount of the rent for the period booked. Any cancellations must be made in writing and acknowledged by us. If notice of cancellation is given with less than 8 weeks of your arrival date, the full amount is payable. Holiday / Cancellation Insurance. Once booked, the Tenant is liable for the complete Property rental costs. As such, it is strongly recommended that the Tenant take out suitable holiday/cancellation insurance to cover costs incurred by unexpected holiday cancellation. Booking Protect, which is a cancellation policy, is offered as an option at the time of booking via the Click Book Stay website. Booking Protect is an independent company and in no way related to Click Book Stay. A traditional and cosy, detached cottage on the edge of the famous Gleneagles Hotel and Golf Resort. Refurbished to a very high standard, the cottage offers a beautifully landscaped south facing garden with stunning views towards the hills. Sleeps 2. Bedrooms 1. WiFi. Parking. Garden. Pets welcome upon request. A traditional and cosy, detached cottage on the edge of the famous Gleneagles Hotel and Golf Resort. Refurbished to a very high standard, the cottage offers a beautifully landscaped south facing garden with stunning views towards the hills. WiFi. Parking. Garden. Pets welcome upon request. We loved staying at Strathview. The owner met us and made us feel very welcome.A lot of extras were left for us which we really appreciated . A lot of thought had been put into the decor and the lovely garden. We will definitely be back. On our arrival at the Strathview Cottage, we were welcomed by cake, fresh bread, milk, eggs and flowers - to start our stay. We then had a lovely warm welcome by the owner followed by tea and cake in the wonderful garden with so many hidden gems to spot. The location is ideal for getting to other parts of Scotland - near and far - as well as staying in this lovely area and taking advantage of great walks and cycling routes. A very helpful cycle shop proprietor in the town - Synergy Cycles - who has great coffee and cake as part of his offer. A lovely Elvis fan in the local veg and grocery store supplies you with local fresh produce. The Fish and Chip Company in town is just great - fish was perfect!! The house and garden are just wonderful and comfortable, perfect for chilling, reading your book and sipping a wee dram at the end of a long enjoyable day. Excellent location for exploring the area plus trains to Glasgow, Inverness, and Edinburgh. Beautiful relaxing garden. Felt very welcomed by flowers, bread, milk, eggs and a cake! Owner called in to see if all was OK and really enjoys his guests and cares about their comfort & needs. Great area for exploring the Loch Lomond area but also trains to Glasgow, Edinburgh & Inverness from Gleneagles station closeby. (You will need a car to get around as it is not close to shops). 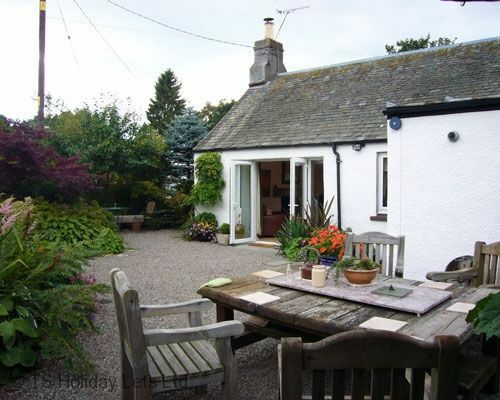 A cosy, traditional, detached cottage on the edge of the famous Gleneagles Hotel and Golf Resort. The closest town being Auchterarder. Recently refurbished to a very high standard, the cottage offers a beautifully landscaped south facing garden with stunning views towards the hills.